The life elixirs of Paracelsus, his great remedies from metals and gems contain the healing powers of body, spirit and soul of a substance. To extract these healing powers separately is the high art of the high alchemy. The appliance of these High Arcana also releases healing impulses in body, spirit and soul of the human being at the same time. “As above so below”, the familiar allegory of the emerald tablet, the “Tabula smaragdina” of Hermes Trismegistos is often quoted in modern esotericism and beyond it. What really is meant by it, only very few know. It is surprising for most that the further text of the emerald tablet explains the basic principles of the alchemical laboratory work. It describes how everything comes into existence under the attendance of the four elements and how the elements participate in laboratory work, in parting the gross and cleaning the fine through distillation and circulation. Moreover, the emerald tablet even contains the hint of the transformation of matter, of the legendary transmutation and of the “power of all powers prevailing over the fine and penetrating the gross”, that is the so called “great work” of alchemy. According to the emerald tablet, all this can be performed in the laboratory “in the small world according to the model of the big world”. And these descriptions are at the same time a hint to the inner transformation processes of a human being, as he is a world in small also. Due to his purification and inner “distillation” healing and lucidity accrue – “as above so below”. Whoever studies the works of the great alchemical physicians like Paracelsus and dips deeper into the science of alchemy concerning the transformation and purification of matter into remedies and into the science of their healing application, meets with the three fundamental principles of sal, sulfur and mercurius, which is simplified by the triplicity of body (sal, salt, the gross), soul (sulfur, brimstone, the mobile) and spirit (mercurius, mercury, the connecting). Everything carries this triplicity, metals, gems and plants just as the human being, animals and even planets and stars. Should anything be transformed, that is purified and made ‘translucent’ and thus healed and endowed with higher vibration, then the triplicity of “body, spirit and soul” has to be parted, purified and newly connected. 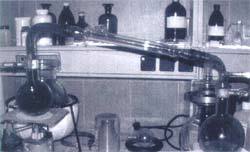 This new unity is “tuned” on a far higher energy level: in the laboratory by circulating of completed substances in closed vessels under very specific conditions and planet constellations; with men by a changed daily way of life assisting the purified healthy body, the clarified soul and the newly aligned spirit. The alchemist needs some certain substances to dissolve from “old combinations”, the so called “Secret Fires” in the laboratory work. With the help of these solvents even the hardest substances as metals and gems can be separated in salts (= body), oils (= soul) and alcohol respectively in alcohol dissolvable substances (spirit). It is a mystery to the common chemistry and physics, that an oil can be extracted from a gem or a metal. Just as mysterious are the “Secret Fires” themselves, which are neither a strong acid nor a base, but are able to liquefy the hardest substances. What these solvents are and how they are produced, is on of the greatest secrets of alchemy. But they are the precondition of any work in the ‘high alchemy’ such as the handling of metals and gems and the production of the high remedies of alchemy, the so called ‘High Arcana’. Two of the “Secret Fires” (reddish in dense and fluid form and bluish powder), the universal solvent of the alchemy. With the help of them even metals and the hardest gems as diamond can be dissolved. Just shortly before the turn of the millennium, the two German alchemists Achim Stockhardt and Daniel Hornfisher succeeded maybe for the first time since over 500 years to rediscover and produce all these “Secret Fires”. It had taken them over 25 years of laboratory research and studies of the ancient scriptures to get there. There are seven “Secret Fires”, crowned by an eight “Fire”. They are also called “our fire”, “salt fire”, “fiery salt”, “hidden fire”, “the magic fire”, “the fire against the nature”, “the snake rod of Hermes eliciting the water from the droughty rock”. They have one thing in common: During the complicated production process two fiery substances connect in the so called “chemical marriage” and a new substance is born with the co-operation of other means: the child, the “hermaphrodite” holding the powers of its source material on one side and showing in addition to it further, completely new characteristics on the other side. 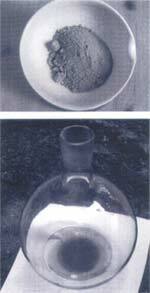 Only such solvents permit the complete separation and extraction of sal, sulfur and mercurius. Any substances like metals, gems, minerals and plants may actually be transformed in a high remedy only in such a way. For other production processes as homoeopathy and the Bach flower method the spiritual information (mercurius) of a substance is won as remedy in the first place; for alcoholic extractions as plant medicines also the sal powers and some sulfur powers are partially won, yet without their purification from poison and without any energetic potency. Not all the three healing powers of a substance, that is the healing of body, spirit and soul, can be extracted together with the help of such methods. Particularly the healing power of the soul, in which the bigger part of the entire healing power is concentrated, gets lost using other production methods. Even with the help of the secret solvents, the alchemical production is still a difficult and tedious process. For the extraction of an alchemical gem essence for example, the gems are dipped in one of the seven “Secret Fires” first. “The mercury of the crystals” matures in this way during several weeks in the light of the sun and the moon and in consideration of certain planetary constellations. The vessels have to be swayed rhythmically twice a day every day. Due to the “Secret Fire”, the mercurius, that is the form giving and healing information from the gems, dissolves during this process. Moreover the male part of the sulfur, the “sulfur of mercurius” is extracted. One of the higher alchemical secrets is, that there exist two different sulfurs: a male and a female one, to be compared with the male and female part of the human soul called the Anima and Animus by C.G. Jung. Both sulfurs must be contained in a high remedy. The female element of the sulfuric principle is extracted in the following tedious fire processing and the subsequent dissolution of the gem. Thereonto the sulfur gets “purified”. first. The gem is repeatedly annealed and subsequently dipped into a water bath until it has lost its colour completely – the visible expression of the sulfuric. According to the alchemical science it is traced back to its formation process that far, until its mineral matter reaches the “status nascendi”, that is the moment in which the particular raw material and the energies join to give birth to the gem. Thereafter, a part of the gems is annealed further to cinder. The latter is doused with water several times and the salts are rinsed. The solvent is evaporated repeatedly and purified and refined again and again until the substance body has become the pure salic principle. Only now it can represent the “Corpus” of the later gem essence, which is its mineral frame. The other part of the annealed gem is levigated to powder. The latter is blended with special, so called mercuric water and distilled several times. Slowly an oily fluid is formed on the bottom of the bulb – the powdered gem dissolves completely. Amazingly, this oil shines in just the same colour the gem did before the processing – and this even though the stone was burnt to colourlessness. A colourless ruby powder so becomes a red oil again. For an alchemist, such mutation is the visible expression of a felicitous transformation of the original material into the secret oil of the gem. This oil corresponds to the female sulfur of the crystal. As a last step, the single ingredients, that is the oil, the cinder and the alcohol of the preparation respectively mercurius, sal and the two sulfurs get united in several work steps. Here also, certain important energetic circumstances have to be considered and the whole has to be circulated several times and has to be charged in the light of the sun, the moon, the planets and the stars. Only when all steps in this three-stage and several months lasting process are successful, an actual alchemical gem essence is generated. Containing the healing power of body, spirit and soul of the particular gem, the essence is able to harmonise likewise all three levels in a human being – body, spirit and soul. And as the stone is purified and transformed to become a high alchemical remedy, also the prepared gem essence is able to purify and transform the human being. When the special solvent for metal produced with the help of the “Secret Fires“, the so called “Philosophical Mercurius” is doused over the prepared gold, immediately the colour and at the same time the healing power of the gold is extracted. In a similar way, the production of healing elixirs is done with metals, for example the legendary “drinking gold of the alchemist”, known in the Middle Ages as universal remedy, the “Aurum potabile” produced from gold. (See also the article of the last issue: “Rediscovered: The Life Elixirs of Paracelsus”). With the help of the “Secret Fires” the so called “Philosophical Mercurius” is here extracted at first, an alternative of this solvents. With it, the “arty prepared” gold is doused, whereby it looses its colour in an unexplainable way. The latter vests in the solvent. The big body of the metal remains in a whitish colour and reminds of talc. It cannot be reduced chemically to metallic gold, a factor that cannot be explained by the today science. “The king (gold) has been bereft of his soul” with its colour, according to the alchemical terminology. However, in it the potency and the remedy, the “Arcanum” of the gold is hidden. The outer body, the remaining rest matter is only obstructive for evolvement. Great alchemists like Paracelsus and Basilius Valentinus for example emphasize this time and again in their works. The metal extract won by these means is sweeter as sugar and of balsamic odour after the further processing. It has nothing in common with any metal colloids, in which the gross body is merely dispensed finely. Just as little it is comparable with acetone or other extracts of which none of them is able to free or extract the ensouled principles. After this most important step, also here a several weeks lasting further processing takes place until the final healing essence is won. The great alchemical physicians as Paracelsus have recognised in their healing activity, that many diseases can only be cured by such special elixirs forever. The reason for it is due to the fact, that they are able to dissolve the cause of a ailment simultaneously on all three layers of a person – body, spirit and soul. The body is strengthened and the self-healing process is activated. The soul is purified and lightened. And the spirit is freed, elevated and able to reorient. Copper is prepared for the so called “green Lion” (a teal powder and fluid) and transforms during the distillation to a deep golden red fluid. The change of colour, very clearly described by the old alchemists as Isaacus Hollandus, shows the successful transformation of copper in a high remedy: the copper essence as a High Arcanum. Whoever likes to go further than the abatement of his problems and really wants to accomplish a fundamental purification of body, spirit and soul, will experience a similar deep inner process as the metals and the gems did, passing through the processing of their essences – “as above so below“. The person does not only face his hardenings in the body, i.e. the sal, but also the crystallisation of the spirit and the soul. They have to be looked over and detached, supposed they cannot be elevated on a higher level. The emotions, the sulfur, are freed, purified and the own female and male soul parts newly connected. And spiritually not only a completely new alignment of the mind has possibly to take place, but thinking, feeling and acting have to be harmonised really in the first place. According to the alchemical teachings, the inner path is also three folded in the stages of Nigredo (= blackness, sickness, lowest vibration level), Albedo (= whiteness) and Rubedo (= redness, highest vibration level). These stages were called after the colours the matter embraces stepwise during the transformation of the great work (also called “peacock tail”). The inner transformation supported by the essences of the Higher Arcana, the High Alchemy according to Paracelsus, is similarly the great work inside a human being.